Hirewire is a location based app that allows service industry job seekers and employers to schedule in-person interviews on-demand. Looking for a job nearby? - Create a profile within minutes. No resume needed. - See who's hiring near you and apply with a single tap. 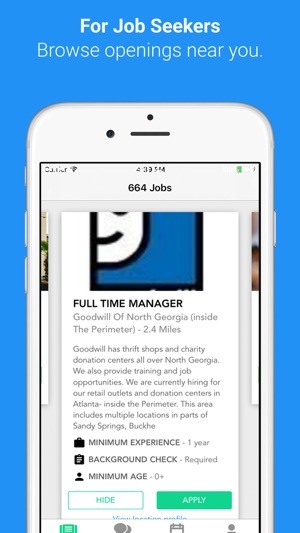 - View employer profiles, open positions, and chat within the app. - 5,000+ employers are using Hirewire to find quality candidates. Are you an employer searching for local talent? - Tell us what you're hiring for, set your schedule, and start interviewing. - Screen candidate profiles, video intros, and chat within the app. Hirewire is committed to improving the hiring process. Have questions or feedback? We want to hear from you! Email us at support@hirewire.com any time. Not getting enough interviews? Now you can boost your profile so that employers see you first among their applicants! I want to first tell you look at all the positive reviews. So short and overly positive; obviously fake. “5 mins and have multiple interviews” when the app takes far more time asking you for a ridiculous amount of personal info. I know, I know, it needs it for a resume of sorts, but the REQUIRED video introduction and other things are unnecessary for the minimum wage jobs they offer you. And after all that info, it can’t show me a job less than 40 miles away. Not to mention they are all above my age limitation. This app was a waste of time and a waste of me giving them my data that they now will sell. Ive applied to many jobs via hirewire and have messaged managers, gotten interviews to jobs you wouldnt get the chance to get using the usual route, and ive been hired through this app. Love this app. I will always use it when job searching. I WISH it would let me filter jobs and adjust mileage and change job history through the app. But it works fine otherwise.